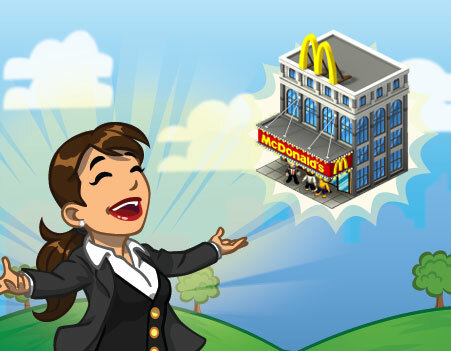 Trying to prove that you can never have too much advertising in a Facebook game, McDonald's has come back to CityVille yet again, with the newest installment in the themed restaurant franchise being the Times Square McDonald's. As usual, this Times Square McDonald's replaces the general "Burger Restaurant" in your city, but this will only remain true for a limited time. In this particular promotional period, you'll have just 12 days to earn enough mastery points to receive a special prize at the end worth an 18% payout bonus. Each time you wish to supply the business, it will cost your 100 Goods. For each supply, you'll earn a single mastery point, and the business is considered to be completely mastered after you've collected 20 points. Remember, in order to more quickly master this particular business, you'll want to only leave it "open" in your city. That is, only supply it with Goods and leave the rest of your businesses static, so that all of your town's potential customers immediately head to the McDonald's. Again, this Times Square McDonald's building will only be available in the game for the next 12 days, at which point the business will likely revert once again into a general Burger Restaurant. Make sure to master this version in time for the exclusive new decoration and good luck in doing just that! Are you excited to see McDonald's returning yet again to CityVille? What other sorts of real-world businesses would you like to see represented in the game? Sound off in the comments.